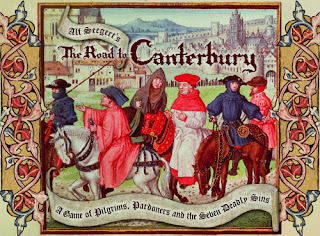 Greed, Pride, Gluttony, Wrath, Luxury, Idleness, and Envy - the infamous "Seven Deadly Sins." For the faithful, they instill horror. For you, on the other hand, they present a wonderful business opportunity! 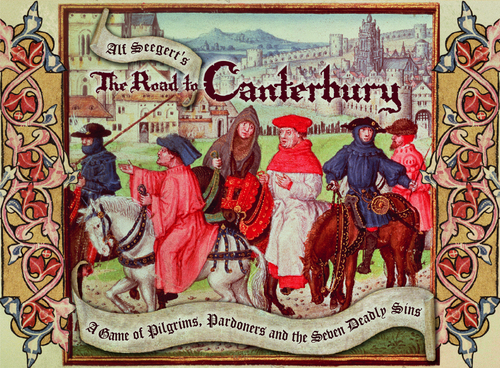 In The Road To Canterbury, players are medieval pardoners who travel the Road to Canterbury tempting Pilgrims with the Seven Deadly Sins - and then pardon these sins for a fee! Each sin with which a player tempts a Pilgrim increases the amount of money that will be paid when pardoned, but also brings Death one step closer, which threatens to kill off your customers! These are "deadly sins" after all. For this and other great games come visit us at Off The Charts Games where we have a broad spectrum of board, card, and dice games, as well as jigsaw puzzles. We are located at 30 NW 2nd St in Historic Downtown Gresham.